Photographer Arif Gardner captures Andreya Triana in the Virgin Atlantic London Heathrow Clubhouse. 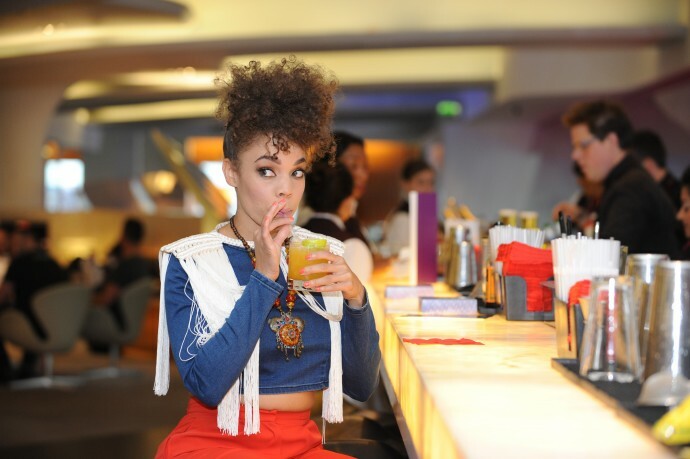 AG Studios were asked to the Virgin Atlantic London Heathrow Clubhouse to take photographs of London-born singer-songwriter Andreya Triana who performed Virgin’s first ever live gig in the lounge, treating out-bound flight clients to a wonderful surprise. Andrea's exclusive set featured songs from her acclaimed debut album Lost Where I Belong and her second album Giants. Photographer, Arif set the photo shoot to make the most of the location within the Virgin Atlantic London Heathrow departure lounge. After a busy summer schedule, including a performance on one of the famous stages at Glastonbury, Andreya prepared for the gig by enjoying a massage in the Clubhouse Spa and afterwards relaxed at the bar with her band, sampling the ‘Triana’ cocktail which was developed specially to celebrate the Clubhouse gig. Arif Gardner, proprietor and photographer at AG Studios in St Albans, Hertfordshire shot a set of great PR images of the event, showing the vibrant atmosphere created and some exclusive shots of Andreya enjoying her aforementioned cocktail. One hour before the gig was about to start it was revealed the videographer who was coming to capture the event was unable to attend. When Virgin asked Arif if he had video filming equipment with him, he had to reply NO! But always willing to help a client he said half jokingly "I’ve got my iPhone 6"... and that is exactly what happened! Unbelievably with a hand held phone Arif carried out not only an interview with the star herself, but managed to film (with hand held tracking shots too!) a whole track of Anreya singing live. This really is a first for Arif and AG Studios - an amazing collaboration of the mighty Virgin Atlantic and Apple iPhone, with a professional experienced cameraman and producer at the helm, provided the client with a result they were absolutely thrilled with. The video was edited on-site within the lounge by Arif on his MacBook Pro and was uploaded to social media for all to enjoy and to assist Virgin Atlantic with their promotions. Arif was as amazed as anyone at the quality the iPhone 6 produced at its HD setting, he said "it was just such a great quality, not only the picture, but the sound as well!" Please do check out the amazing phone footage and the event photographs.